It’s impossible to spend any time in New Guinea without encountering World War II history. Strewn across the mountains are pieces of planes that went down during the war. The coastal waters teem with reminders, too. While scuba diving, I saw submarine caverns, downed planes, remnants of transport ships, and luggers, and large, twisted pieces of metal dating back to the war. In the mountain villages along the Kapa Kapa trail, people still tell stories of the U.S. Army’s march across the mountains. Villagers showed me where soldiers collapsed in the mud, unable to go on. One of my most fortuitous encounters was with a man named Berua, whom I met in the village of Laruni. Berua was only seven when his parents were chosen to serve as carriers for the American army. Frightened that he would never see them again, he followed his parents and the American army over the Owen Stanleys. It was an experience he would never forget. On the coast, villagers still talk of the war. These war stories have become part of the local mythology, passed down by people from one generation to the next around the fire. Resentment lingers. The war destroyed villages and innocent people’s lives. In many cases the locals’ stories resembled the accepted historical version. However, in some cases, they have been wildly, and interestingly, embellished. One man suggested that it was a native sorcerer who had warned the Allies of the Japanese invasion. He went on to say that the sorcerer later flew over Japanese positions on the coast and alerted American artillerymen, so that they could sight in their big guns. Another man said that the war ended when a native sorcerer killed Japan’s most important general. In the summer of 2005 I made a one-month trip to Papua New Guinea. I spent that month researching the war and the trail. I also visited Gabagaba, Doboduru, Buna, Siremi, Oro Bay, Pongani, Wanigela, and a number of inland villages, where I interviewed elders who had witnessed the war. In Buna I heard stories of the Japanese invasion. In Gabagaba, people talked about the arrival of the Americans, especially the African-American engineers. In the United States, during the summer of 2005, I attended a five-day 32nd Division Old Timers gathering at Fort McCoy, Wisconsin. Our accommodations were Army barracks. On my first day, I watched a man make his bed as if a tough sergeant would be inspecting his work: Not a crease in the top sheet, the corners tucked in, the pillow fluffed like a cumulous cloud. Although it was only early June, it was already in the high 90s. Enormous fans cooled the barracks, but they only did so much. I didn’t understand how the older guys could take it until they set me straight. “This is a breeze compared to New Guinea,” one said. I was in the real old-timers’ barracks. Bill Barnes, who was a Second Lieutenant at Buna, was 95. He wore big coke -bottle glasses and had a pacemaker but looked like he could still run a marathon. Lawrence Chester Dennis was 93. At Buna, he had run messages from headquarters to various companies across the front, earning him the nickname “moving target.” Dennis was nearly blind now, so the guys set out his clothes, made his bed, took him to the bathroom, and made sure he got to the events on time. Then there was Roy Gormanson, who, the first time I met him, took off his tie and shirt and showed me his mangled left shoulder. “Took three operations to get it this good,” he said. “And still I can’t lift my arm over my head.” Many of the guys in my barracks had trouble walking. Nearly everyone had diabetes. A bunch had been through heart bypasses. They all took an assortment of pills. Yet for five days they joked with each other as if they were young GIs. They joked wherever they went – in the mess hall, in the communal showers, as they peed into a large trough, and in the morning on the “shitter” that sat in plain view of five or six others. “No goddamn privacy in the army,” an old-timer commented. One morning one of the guys announced as he settled onto a toilet seat that he was going to die, not of a stroke or a heart attack or colon cancer. “I want to be shot by an irate husband,” he said. The entire bathrooom roared. At night the guys played poker in the mess hall and drank beer. And sometimes they talked about the war. Mostly, though, it was a subject they avoided. Red Lawler, who is in his nineties now and still runs a pizza parlor in Oshkosh, Wisconsin, said, “I saw so much death in New Guinea, I like to forget. It was a horrible place.” One man – I never did learn his name – told me that when the battle for Buna was almost over and the Americans were mopping up, looking for stray Japanese soldiers, he and a young private stood on a beach. The private had just finished showing him a photo of his wife and little boy. “Sure can’t wait to get back to them,” the private said. Just then a shot cracked out of the jungle, and the private fell. The bullet had taken away half his head. One man from Michigan had a list of everyone from his company, and started reading off the names. “Gone,” he said. “Dead. He’s gone, too. He passed away not too long ago. He’s dead, too, now. Goddammit,” he said, as if realizing it for the first time, “they’re all gone.” Eventually it was clear that with so many of the guys gone I’d have to start contacting sons and daughters, even grandkids. That search brought me to southern Indiana. It was after my visit to Bill Boice that I began writing. And it was then that I decided I was going to walk across New Guinea in the footsteps of the Ghost Mountain boys. My journey began with my scouting trip in August 2005. Almost everyone I met in Papua New Guinea warned me not to try to repeat the march. The Kapa Kapa was a rugged hunting and trading trail in 1942. No one knew if it still existed. Besides, they said, the country was too rough: cliffs, rivers, snakes, mountains, mosquitoes, leeches, and disease. And who knows, they said, whether the people will let you walk through their tribal lands. Some of those mountain villagers barely know the outside world exists. They still hunt with spears and slingshots. In June 2006 I began the trip, accompanied by a friend and part-time filmmaker from Chicago, an Alaskan pal, an Australian expat living in Port Moresby who had spent lots of time in the New Guinea bush, a photographer from Hong Kong, and three Papua New Guinea cameramen from Port Moresby’s POM Productions. If we succeeded, our expedition would be an historic event; no outsider had attempted to walk the entire trail since the soldiers did it in 1942. On the first day, climbing down to a river on a red clay trail as slippery as lake ice, I fell, tumbling head over heels with a sixty-seven-pound pack on my back. When I got to my feet, I knew that I had torn a ligament in my knee. I limped for another three hours until I could walk no more. My pulse was fast and thready, my vision blurred. I knew I couldn’t make it, so I turned back and walked out. My friend George from Chicago accompanied me. That night we slept in a village in a hut made of woven bamboo, and we were told to be on the lookout for sorcerers. The following day we stumbled out of the mountains and hitched a ride to Port Moresby. 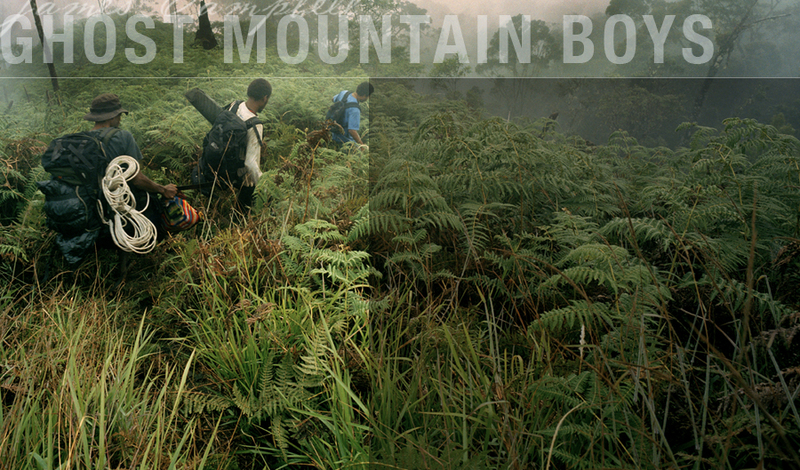 Four days later, equipped with painkillers and anti-inflammatories, and determined to follow in the footsteps of the Ghost Mountain Boys, we were helicoptered back into the jungle.